BlueSky Heavy Furled Tapered Leader for 7 wt. fly line and heavier. Excellent for wind resistant bass bugs, big streamers and a proven saltwater fly leader. Length 6 ft. plus added tippet, creating an 8 to 12 ft. leader. 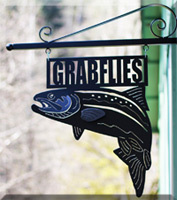 Grabflies.com like to use this with ten foot tips creating a perfect 15 foot tip. BlueSky Furled Leaders - Great Turn Over - just change the tippet, not the leader. Great for Spey Casting, use as or with a tip. Can be added as a cheater or in place of a Poly Leader.